Air-stirrup Schematic View shows the exceptionally versatile support, suitable at some stage for virtually every ankle injury. The molded sides approximate the ankle and fit comfortably in the shoe. Pre-inflated and adjustable aircells line the interior, conform to the individual, and gently compress swollen tissue. When worn with a laced shoe the AIR-STIRRUP® effectively limits inversion/eversion. However, normal flexion is only slightly inhibited in the standard models, and virtually unrestricted in the Ankle Training Brace. The aircells lining the sides contain two compartments. One covers the distal 4", the other the full length. Both compartments are lined with a compressible foam, and are preinflated. 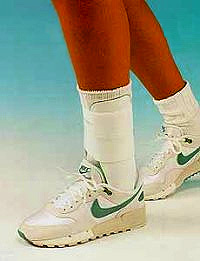 AIR-STIRRUP® Ankle Braces are made to be height specific. Please choose your height when ordering. Aircast Tennis (Pneumatic Armband) - State of the art tennis elbow brace - applies 50% more pressure to the involved area. Green Superfeet Insoles - High Support Synergizer Profile - Superfeet green active premium insoles offer a maximum support profile, with high arch support; best utilized in running, athletic or casual shoes with removable insoles or high volume.